Bishop William J. Barber, II is Pastor of Greenleaf Christian Church, Disciples of Christ in Goldsboro, North Carolina and President and Senior Lecturer of Repairers of the Breach. He is also architect of the Forward Together Moral Movement that gained national acclaim with its Moral Monday protests at the North Carolina General Assembly in 2013. These weekly actions drew tens of thousands of North Carolinians and other moral witnesses to the state legislature. More than 1,050 peaceful protesters were arrested, handcuffed and jailed. He has served as president of the North Carolina NAACP, the largest state conference in the South, since 2006 and sits on the National NAACP Board of Directors. On July 22, 2017, the College of Affirming Bishops and Faith Leaders consecrated Rev. Barber as Bishop of Repairers of the Breach, a nation-wide network of faith-based intersectional justice organizations. Bishop Barber is regularly featured in media outlets including MSNBC, CNN, The New York Times, The Washington Post and The Nation Magazine, among others. He is the 2015 recipient of the Puffin Award and the Franklin D. Roosevelt Four Freedoms Award. His two most recent books include Forward Together (Chalice Press) and The Third Reconstruction (Beacon Press). 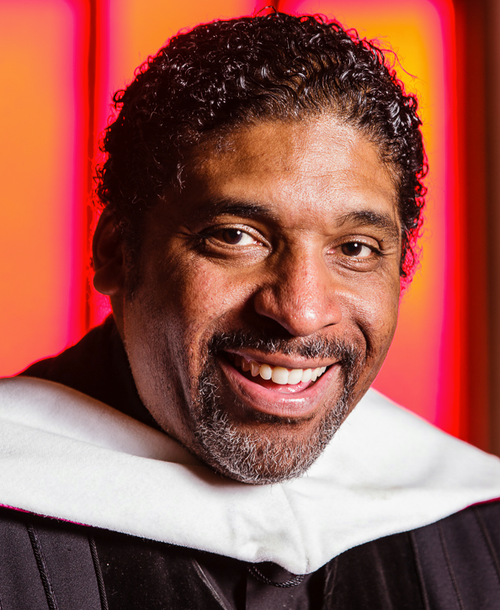 The recipient of numerous awards, in 2018 Barber was named a MacArthur Fellow for “building broad-based fusion coalitions as part of a moral movement to confront racial and economic inequality.” Reverend Dr. Barber received a Master of Divinity from Duke University; and a doctorate from Drew University with a concentration in Public Policy and Pastoral Care. A former Mel King Fellow at Massachusetts Institute of Technology, he is currently Visiting Professor of Public Theology and Activism at Union Theological Seminary in the City of New York and is a Senior Fellow at Auburn Seminary.